"Never Say Die/Washes Whiter Than"
Petra is one those bands that has a very extensive history. Starting out as a Southern Rock band in the 1970s, beginning in 1972. As most Southern bands were popular in the 1970s, such as the Allman Brothers Band, Lynyrd Skynyrd, Marshall Tucker Band, etc. Petra was formed as yet another band in the style of Southern Rock. However, they would branch into other styles of their music, such sounding as other popular 1970s bands as Foreigner, Styx, and Journey. Washes Whiter Than would not be considered a "Southern Rock album." It does its "Pop" aura, and having a sound that equally matches that of "Christian Pop" at its time. In comparing to the likes of Foreigner, Styx and Journey, they would be more compared to Styx. On both these albums, the lead vocals were provided by Greg X. Volz. "I'm Thankful" and "Why Should The Father Bother" are truly good songs to start out the album. These first songs are "Christian Pop" of the time, and as I listen, a little country sounding ("I'm Thankful"), as in Alabama, and the Alan Parsons Project, as in their hit "Games People Play" on "Why Should The Father Bother." And also on this song, there are great harmonies. As more tracks that follow, the album gets quite interesting. "Morning Star" sounds more like the early years of Styx. "Magic Mirror" also has a slight vocal resemblance to Dennis DeYoung of Styx, and is another good Christian Pop sounding tune, and again, sounding like the early Styx. "Mary's Song" has Petra in the category of "Soft Rock", as this song is truly a beautiful sounding track. The soft style is also on "Yahweh Love.". Greg X. Volz's vocals has a slight resemblance to that of Canadian band Triumph, Rik Emmett. Then it becomes incredibly funky on the next track, "Taste And See." "Deep Love" is another "soft rock" tune, as it ends the album, and sounds off-Country, as if the Country act Alabama could record this song. Never Say Die -- (4th album; 1981) "The Coloring Song" begins this album, and is way different, after listening to tracks from their previous album, Washes Whiter Than. Pop sounding, yes, but its really hard to explain, maybe Celtic? A good song, yet the previous album tracks are better. "Chameleon" is another interesting tune, as it has a more Progressive Rock style, as in the band Kansas, and Styx. The ending of the song has its Progressive Rock organ. "Angel Of Light" definitely has a harder rock style, maybe even Progressive style. The harmonies are well-done here as well, and has a resemblance of their harmonies to Queen. "Killing My Old Man" is another good harder Rock track, and was controversial with its song title, as the band would representing Christian music, and its faith. Definitely sounding like most harder Rock bands of the 1970s. "Without Him We Can Do Nothing" is another harder edge Rock track, sounding like Boston ("Don't Look Back". The title track not only is a Rock tune, but it has a certain soulfulness to it. Boston comes to mind ("Let Me Take You Home Tonight" on "I Can Be Friends With You." "For Annie" could easily be one of those many heavy-metal ballads, as in Winger's "Heaven." It's another beautiful song. "Father Of Lights" has a more upbeat Pop feel, and also "Deep Love," being both harder rock songs. 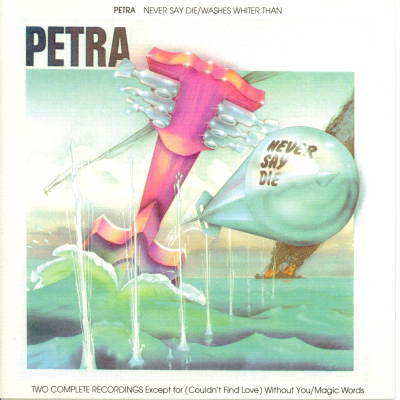 Overall, both albums Washes Whiter Than and Never Say Die are very well recorded albums by Petra. There's something for everyone on Washes Whiter Than: It has its Pop, Rock, Funk, Progressive. Never Say Die progressed more into harder rock. And, overall, there are great comparisons of Petra, to the likes of Styx, Boston, Kansas, Triumph, Queen, and even April Wine. © WSVNRadio.net. All rights reserved. Review or any portion may not be reproduced without written permission. Cover art is the intellectual property of Star Song Records and is used for reference purposes only.